Light: Receiving a wake-up call. Discovering a new purpose in life. Becoming totally and completely yourself. Receiving a well-deserved reward. Passing an evaluation or examination. Welcoming the start of a new phase of life. Shadow: Being weighed in the balances and found wanting. Failing to measure up to a well-defined standard. Being caught goofing off or misbehaving. Failing to prepare for an examination you know is coming. Rejecting an opportunity to reinvent yourself. Mythical/Spiritual: The resurrected Christ. The Last Judgment of Revelation. The phoenix, which rises to new life from its own ashes. Story: Having earned a victory, the main character sees himself or herself differently. Alternatively, others see the main character in a new and flattering light. Relationships. Freshen your relationship by taking advantage of opportunities to reinvent yourself (and each other). Swap roles. Seek out entertainment you would normally avoid. Shatter habits and breath new life into your partnerships. What you learn in the process could be a wake-up call for you both. Work. If something or someone is holding you back, it’s time for a “Come to Jesus Meeting” — a time to air dirty laundry, read someone the riot act, or say out loud what, to this point, has only been said in private. Identify the problem and eliminate it before the decay spreads to other efforts. If things are going well, use this as an opportunity to define why, so you can replicate your success elsewhere. Spirituality. With a shock, we realize the impermanent nature of this world. Use this sudden insight to your advantage. Answer the trumpet call and reinvent yourself by refusing to cling to distractions. Set aside your stumbling blocks and embrace transformation. Personal Growth. The assessments of others cannot impact your true value. The only standard you must meet is being the very best version of yourself you can be. Identify your next steps … and take them. Don’t do this for others; do it for you. Fortune Telling. An old issue you thought was over will come up again today. Get ready for huge changes: break-ups, sudden calls from old friends, and unexpected setbacks. God’s trying to get your attention. Gabriel. In the apocalyptic visions of the Book of Revelation, Gabriel summons the dead from their slumber with a blast of his trumpet. In your situation, who needs a wake-up call? The crossed banner. In Tarot: History, Symbolism, and Divination, scholar Robert Place identifies this as Constantine’s victory flag. “When held by Christ or Gabriel, it represents victory over death.” How would your life change if you put a fear of death or loss aside? The resurrected dead. 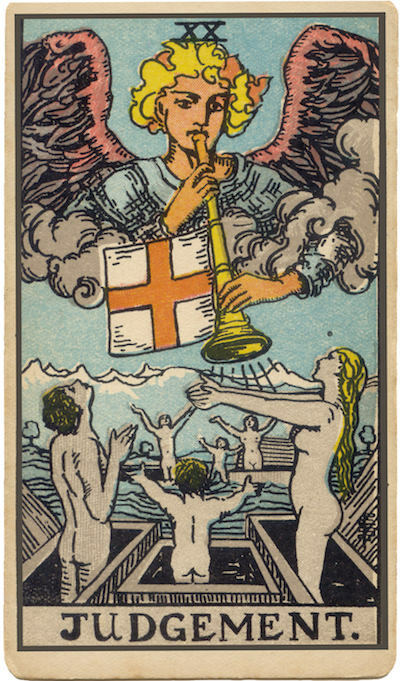 In both the Marseilles and RWS-influenced cards, the risen show only positive emotions. The trumpet call liberates and re-creates them. In what way do you need to be reborn? What is the main thing I need to realize about myself? In what way might the universe be trying to get my attention? If I were to reinvent myself, what would I become?